Age-related changes in the orbit around the eyes (loss of skin elasticity, tone and thinning of the skin) can cause the infraorbital margin to retract. This can lead to a more sunken appearance in this area and a groove that begins at the inner corner of the eye and travels down and out across the cheek, which is commonly referred to as ‘tear troughs’ and dark circles appear around the eye. Tear troughs develop as a result of age-related changes in the orbit around the eyes and specific life-style factors. What are the indications of tear trough correction? At Bedford Skin Clinic, we use a range of dermal fillers for tear trough correction. These include Restylane, Perlane and Teosyal Redensity 2. 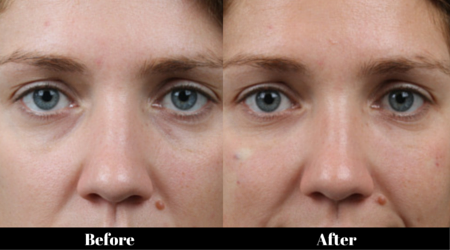 For those with larger ‘bags’ under the eyes this treatment may not be suitable, in such cases we are happy to advise regarding alternative treatment options. Prior to correcting the tear trough area, it may be necessary to treat any ‘crow’s feet’ with Botox, as well as any loss of cheek volume with dermal fillers to achieve optimal results. At Bedford Skin Clinic, we inject the tear trough area using a cannula, the most advanced methods of tear trough correction, hence there is minimal downtime and complications are rare. The treated area looks slightly swollen for a few days and there is minimal possibility of bruising. There is minimal discomfort after the procedure and we advise our clients to take oral paracetamol if required. Clients can usually get back to normal activity on the next day.